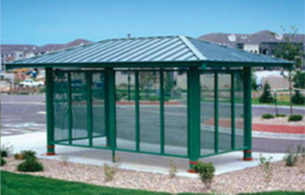 Windscreens are best used in smoking shelter or transit shelter applications. 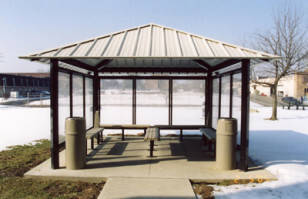 Polycarbonate windscreens are single preformed picture frame sections which are powder coated to match the color of the steel frame of the shelter. Perforated metal screens shall be made of picture frame sections with perforated .063 gauge Type 3003-H14 aluminum perforated screens which shall be powder coated to match the color of the steel frame of the shelter. The perforated aluminum sections have ¼” diameter holes with 5/16” staggered centers. Perforated aluminum metal screens are best used in portable toilet enclosures or equipment storage facilities.